John Woodhouse speaks about the relevance of Martin Luther King to today's world. This event commemorated the speech Martin Luther King gave in the cathedral on 6th December 1964. 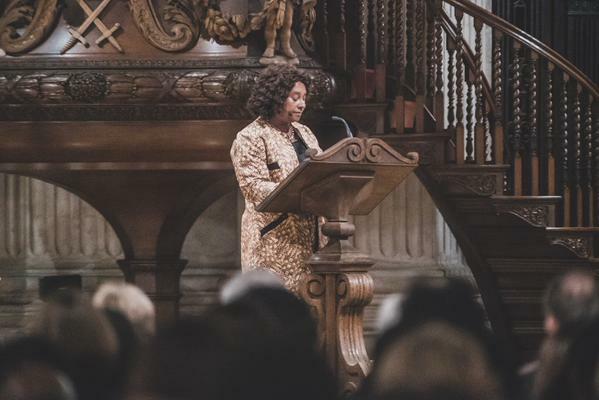 The chair was the Dean of St Paul’s and the speakers were Baroness Doreen Lawrence, Dr Heidi Safia Mirza of Goldsmiths College, University of London and the journalist Hugh Muir. Corey Samuel of the Renaissance Foundation introduced the evening by speaking of the influence Martin Luther King has today on young people. Dr Mirza outlined the 3 dimensions for a complete life in Martin Luther King’s 1984 speech. Firstly the length of life and the inner care of self. You should have pride in what you do and say “I am somebody”. She pointed to the fact that black people are 5 times more likely to be in prison in the UK and far less likely to be in boardrooms and university. Secondly, the breadth of life in the sociological aspect involving the care of others. She spoke of attacks on migrants, asylum seekers and Muslims and asked whether globalisation can help.Thirdly, the height of life and the need for spirituality. Hugh Muir noted tremendous changes since 1964 and racist election at Smethwick. He pointed to increase in mixed heritage and 100 different languages spoken in London boroughs. He was optimistic in the shared pride in events like the London Olympics. But he commented on the poor relationship with the criminal justice system of many black people and the large number of over-qualified unemployed. He said that in Canada there is a minister for multiculturalism. Governments can set the tone. Baroness Lawrence spoke her hopes and dreams for a precious future. She said that she saw despair and poverty. She said that the arguments of UKIP need to be addressed by an “army of love” informed by an army of knowledge just as unsung women domestic workers did in the civil rights movement. It is important to tell the opposing facts and to get into the system to change it. ” A child born in Richmond and Peckham having the same IQ when born and at age 5, but not at age 15. “The Peckham child will not have the same opportunities as the Richmond child. Dr Mirza urged us not to walk on eggshells but to speak out. I left feeling that we could all do something to bring about change. It was a truly inspiring evening.